First, we would like to thank you for visiting our website today. We hope that you can provide everything you need when it comes to orthotics and prosthetics. We here at Custom Orthotics & Prosthetics, LP are focused on providing high-quality service and customer satisfaction - we will do everything we can to meet your expectations. Here on our website you will find out who we are, what insurance carriers we work with (and do not worry if yours is not listed, because we can see what we can work out) and what products we offer here at Custom Orthotics & Prosthetics, LP. Like we said above, our mission is to provide high-quality service and customer satisfaction to our patients and their families. When you walk into our office, you will be greeted with a smile and you will leave with a smile because of the service and information you have received from us. 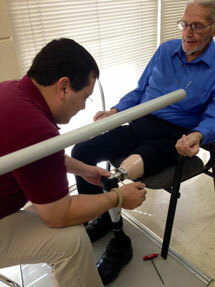 Our staff is knowledgeable on all topic concerning orthotics and prosthetics. You have our word that you will receive the best service possible from our staff and company when you decide to come to us. With a variety of offerings to choose from, we are sure you will be happy working with us. So feel free to look around at the rest of our website. And if you have any concerns, comments or questions, please feel free to contact us. "The blue rocker brace they fit for me is the new front line innovation in orthotics. I would recommend this business to anyone needing this service. Friendly staff, professional, first echelon in patent care."